Happy Birthday Jessica!!! It's Jessica Knutsen's birthday today so the TSG trendsetters have decided to send Jessica some birthday wishes!!! I've had the opportunity to get together with Jessica a few times for crafty weekends and I've always loved every moment of them. Jessica is one of the sweetest people I know and I feel lucky to be able to call her one of my friends. I'm super sad she's moving to Texas soon.... I can't hop in my car with Tobi and Kim anymore so that we can invade the Knutsen house. I guess we'll have to hop on a plane instead, LOL! For my card today, I've used the TSG set called "Ninja Skills" which has been colored with Prismacolor Pencils and Gamsol. The layout for my card is the current Mojo Monday sketch challenge. Adorable! Love your coloring on kraft paper!! Seriously, this little guy just totally makes me smile! LOVE the layout and papers, and your coloring on the Kraft is perfection! 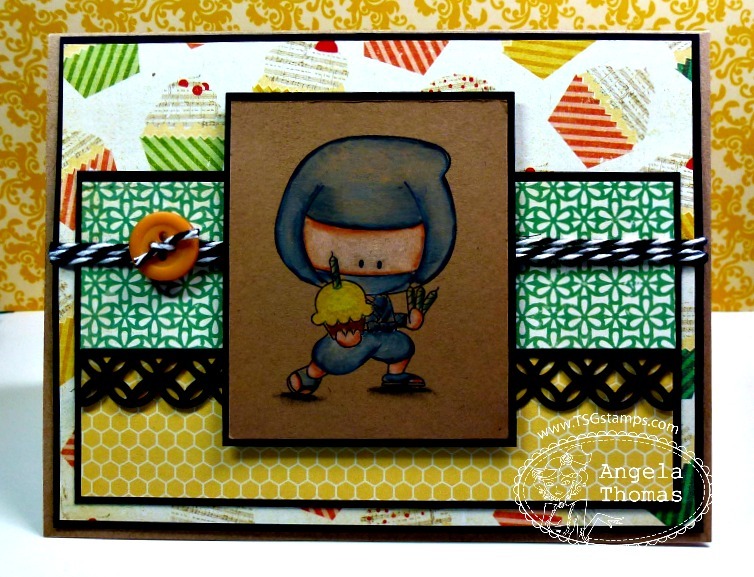 Love this ninja...great colouring on kraft. Happy Birthday Jessica! You are the queen of coloring on kraft...and you are awesome at it!! Love this!! Great Ninja card, for a great Ninja!